5,000 Bosnian Muslims, including 2,000 children, died of starvation in six besieged enclaves, including Srebrenica and Zepa. Sarajevo, Bosnia-Herzegovina (AP) — First, 600,000 leaflets will flutter down on eastern Bosnia, telling residents about a coming American airdrop. Then, tons of food and medicine will fall from the sky. Our hope is to watch for presents from heaven,” said Fadil Heljic, a ham radio operator in the besieged town of Zepa. The Defense Department is not disclosing a starting date for its airdrop into eastern Bosnia, but it was expected to start this weekend. It is intended to help about 300,000 cold, hungry Muslims [Bosniaks] in six enclaves besieged by Serb fighters. Two years ago, when there were reports that a Bosnian Muslim in a Serbian concentration camp had been forced to bite off his father’s testicles, it was comforting to recall the European tradition of fabricated stories — German soldiers amputating the hands of Belgian nurses in 1914, and so on. 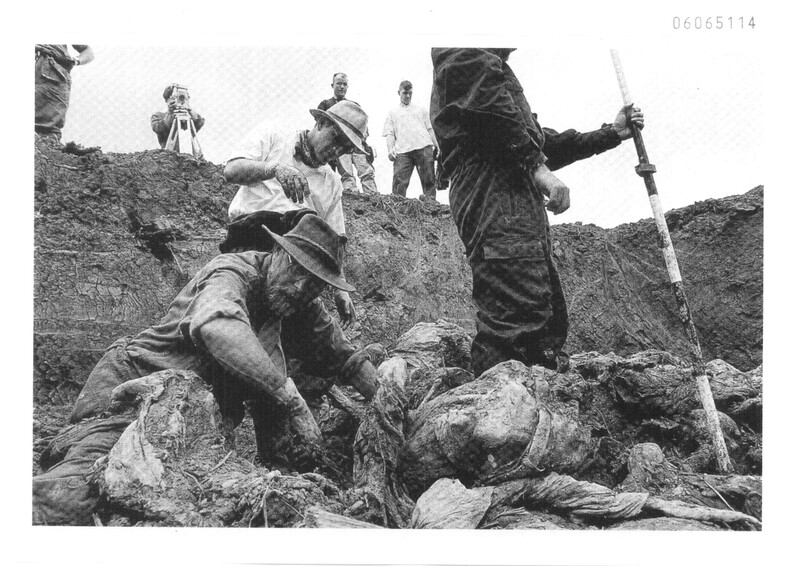 Photo: Pilica mass grave in eastern Bosnia holding remains of Bosniak (Bosnian Muslim) civilians killed by Serbs in the Bosnian Genocide. Credit: The International Criminal Tribunal for the Former Yugoslavia (ICTY). Morillon’s words pitfily summed up one lesson on Bosnia for the Western alliance: To intervene in a conflict and pretend there is no difference between the aggressors and the victims is not only dishonorable but ineffectual. “As for the Bosnian Serb leader, Radovan Karadzic, ‘he will lie, keep lying as he has done all the time, and he will kill more of us in the coming days” – Nedjara Beganovic. 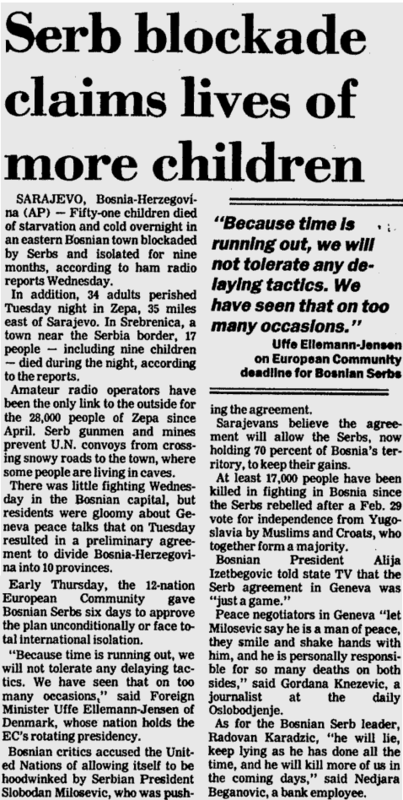 SARAJEVO, Bosnia-Herzegovina — Fifty-one children died of starvation and cold overnight in an eastern Bosnian town [Zepa] blockaded by Serbs and isolated for nine months, according to ham radio reports Wednesday. In addition, 34 adults perished Tuesday night in Zepa, 35 miles east of Sarajevo. In Srebrenica, a town near the Serbia border, 17 people – including nine children – died during the night, according to the reports. There are four legally validated genocides that occurred in Bosnia-Herzegovina, other than Srebrenica. 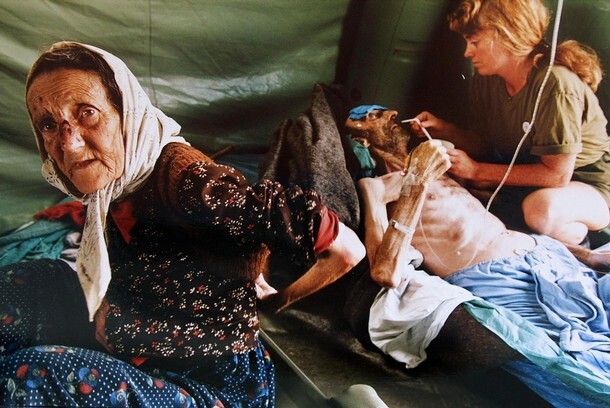 The Bosnian Genocide is the event referring to brutal campaign of ethnic cleansing of at least 500,000 Bosniaks (Bosnian Muslims) coupled with the killings of 65,000 to 75,000 Bosniaks during the 1992-95 war of Serbian aggression. The three international judgements confirming Genocide in Bosnia, other than Srebrenica, include: Prosecutor v Nikola Jorgic (Doboj region), Prosecutor v Novislav Djajic [Dzajic] (Foča region), Prosecutor v Djuradj Kuslic [Kusljic] (Kotor Varos) and Prosecutor v Maksim Sokolovic (Kalesija, Zvornik region). All three cases were tried in Germany — at the request of the International Criminal Tribunal for the Former Yugoslavia (ICTY) — to ease caseload of the ongoing trials at the Hague. IX. Bosniak Advisory Council in Washington, D.C.